The HIP THRUST SLED is the ultimate off-season strength and conditioning machine to develop strength and power in the hips. It is the only sled on the market that allows you to drive with your hips under you instead of behind you. The unique design allows you to either start with your hips behind you in a "Drive Position," or start in a "Power Position" with your hips under your shoulders. 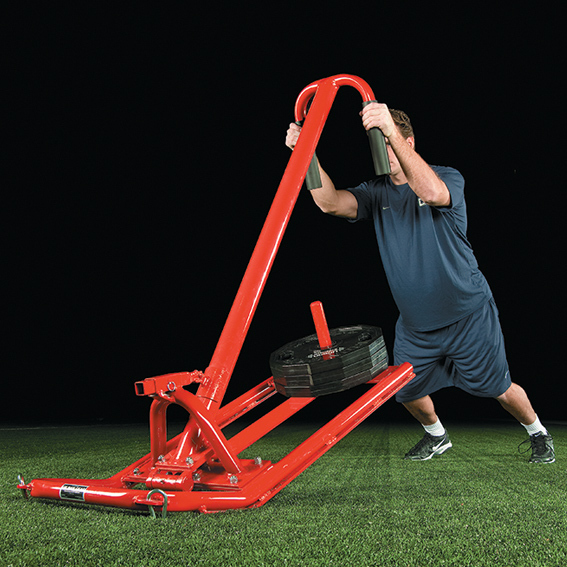 Training with this sled gives you 100% carry-over from the weight room to the football field. The pendulum post with dual hand grips comes off the sled at a 45 degree angle. The dual hand grips have a narrow downward pitch to promote the concept of "inside hands" and the practice of keeping the elbows in tight. Grip the handles and lift the pendulum post as you drive forward. The lever mechanism allows for 9 different height settings from 40" to 50." Select the height setting that is right for the athlete depending on their height and hip flexibility. Flat ski runners glide easily over the turf or grass. The weight horn is located at the back of the sled to provide stability and resistance. The horn can hold up to 8 Olympic plates. Welded corner hooks allow the sled to be pulled with a variety of harnesses. Lightweight and portable. Easy to move from indoor facility to outdoor playing fields. Made entirely of aluminum. Will never rust! "The coaching point is to develop lower body power and leverage!"